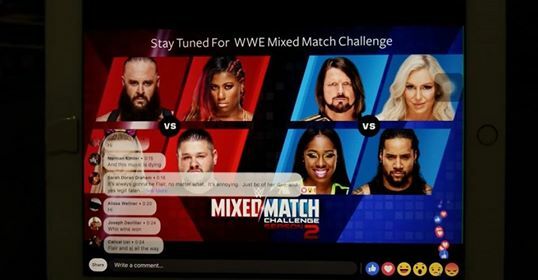 The first season of the WWE Mixed Match Challenge pretty much provded the template of the program: it's a fun romp that serves as a lighthearted go-home for the live audience, something that 205 Live found hard to do as SmackDown Live's unofficial third hour. That fun lightheartedness was on display this week in both laidback matches. With the second season being a round robin instead of a knockout elimination, teams recognized that this is a marathon and not a sprint, and that they don't need to expend energy every time they're out there. Just like the NBA All-Star Game of old (which is before they had the competing teams drafted by the top vote-getters from each conference), it might be fun and laughter in the first three quarters, but when the score is close going into the final two minutes, expect the competitive juices to ramp up. The push-up contest in the RAW bracket match and the now-obligatory dance break whenever R-Truth and Carmella are on hand can be considered the first half of the ASG where players showcase their highlight moments. But once those are out of the way, you can see that the teams go for the win. Seeing Asuka letting her multi-hued hair down is a delight. On hindsight, that name change might be a good decision in this case as she separates herself from her more relentless Kana character back in Japan. Speaking of (previously) golden locks, Carmella showed her true colors as per Renee Young, thank you. The unspoken MVP of the red bracket bout to me is Alicia Fox. She overshadowed the male members of her team. She was in her element from the entrance up to the post-match tiff at gorilla, her disdain of Sunil Singh evident, blaming him for the loss to Bobby Lashley and Mickie James. Alicia's hesitation on going up against current posse mate (can we count Alexa Bliss' clique, er... entourage, eh whatever... as a stable?) James also came into play. And the part where she was clawing at Lashley to stop the pin made me guffaw. Over at the blue corner, I can't say Truth is a clea-rcut winner like Fox, but everybody else worked around him leading to this match. You have Carmella switching lock swatches and alignment to distinguish herself from the "other Carmella," and Truth TV was over with the audience in this match. In the end, though, The Miz and Asuka's teamwork and coordination proved to be the defining factor in the contest as the reigning MMC champions prevailed. It might be unfair to paint Fox and Truth as their respective brand's court jesters, but it's just the uh... truth. Still, they serve a purpose. Unlike a certain reality TV star who has become a walking botchfest since her return to active in-ring action, these two are experienced veterans who have cut their teeth. They may not be high up there in the John Cena/Ronda Rousey totem pole, but at least they are not treated like invisible entities such as Mike Kanellis or The Colons are. The conversations in the comments section during the SD Live fight were split between the action occurring in the ring and the Rusev/Lana/Aiden English "Milwaukee" triangle. I won't be doing a RAW or SmackDown review anytime soon, but this just shows that the blue brand's storylines are more compelling than the supposed "A" show. What a push can do to you. Carmella is no longer intimidated of Asuka after the "Princess of Staten Island" has beaten the former NXT champion before... twice! Miz interfered a Carmella pin. Didn't you realize history has been made? Finally, there's male-on-female action! Uhm, that didn't turn out good. Trivia: There are three former Impact talents in this week's MMC episode. That said, what's up with Country Dominance as James and Lashley's team name? Why is Michael Cole referring to the first season as "last year" when the tournament finished the week heading to WrestleMania THIS YEAR? If King Ross had a "John O'Clock," well, we have a Cole counter at least for this episode. Alicia didn't tag herself in, that's why Lashley had to tag James. Images and video courtesy of WWE. Image of MMC mobile screencap courtesy of RJ Magno.